Three weeks ago, I learned about the Suanpruek 10 hour ultra-marathon, a timed race in which participants race to see how far they can go within the time period. I didn’t have much time to prepare, but I couldn’t pass up the opportunity to run an ultra marathon that is so close and easy for me to go. Plus, the timing was perfect because I was due to be in Cambodia on 7 May and would be passing through Bangkok anyway. The women’s record, set by last year’s winner was only 84km – certainly I can do that! Besides, a chance to race is a chance to learn and there isn’t anything to lose! Check out this inspiring video! I arrived at the race start with my kit: mat, toolbox with food, electrolytes, changes of clothes, and other essentials. Walking around the area looking for a good place to camp, I noticed that various running clubs had set up canopy tents, so I struck up a conversation with one of them, BangKhunTian. “You are alone, and no team? You are welcome to put your stuff here!” SCORE! The cameras came out and before I knew it I was part of their team – which would mean so much more as the race went on. Pre-race fare was hot coffee, white bread spread with jelly or pandan paste and rice dishes like khao man gai (rice steamed with chicken). Talking with people during the race, many of the participants weren’t even there to run all day – they were there to do a certain distance and then stop – and not even try for time. Just run/walk, enjoy friends and the event, then camp out and eat and cheer on all the other saps the rest of the day. It is definitely a different – and refreshing – running culture here. Sure, there are plenty of tough competitors, but a 10 hour ultra-marathon didn’t scare the average and recreational runner from participating. The same goes for the 5 and 10km runs that happen nearly every weekend. It was great to have so many people (over 200?) at the start, and 28 women were signed up for the 10 hour open. I’ve never done a timed event like this where you run around a tight (2.1km) loop, but the brevity of the course lent to intimacy and a lot of people interaction. Spectators were cheerful and smiling and helpful. There wasn’t a time where I was bored, or wish I had an mp3. I was also the only white-skinned female participant (an African woman was part of a relay) so I suppose I was a novelty as well. The event also featured a 2×2.5 hour relay so there were always runners cruising through the course. My adoptive team started really coming on board about three hours into the race. When I came in for a shirt change, they gave me one of their shirts! 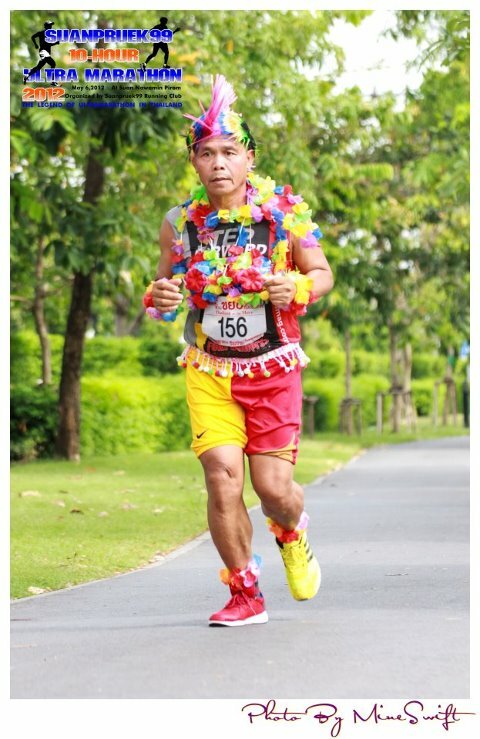 I got many more thumbs up from the spectators after that – I was running with a Thai team! The team started telling me my place and informing me about how far back my competitors were. They gave me cold wet towels for my face. When I was cramping and stretching they offered to massage (I declined the chair) but massaged me as I stretched. When I needed more water or electrolyte beverage, they supplied. The temperature at the 6am start was a balmy and overcast 28C. By 10am the temp would hit 40C and would stay at least that high for the rest of the day. “Drink before thirst, eat before hunger” is what they say and I tried to put electrolytes and sugar in my body every time I took a sip. I also took in fruit and powerbars with a bit of protein as well. I felt pretty good through the first half of the race, and had logged about 50km by the five hour mark. As the race went on, however, it was all I could do to concentrate on my running, eating, and drinking. Sunny Blende, sports nutritionist, says that “ultra races are really an eating and drinking contest with exercise and scenery included”. This is so much truer in hot weather when fluid and electrolyte balance can cost you more than a race. I gradually succumbed to overheating, got dehydrated, and behind on electrolytes, all of which contributed to nausea. I kept pushing fruit and liquids down until at last – relief! – I purged and cleared my stomach. I downed a gel a few minutes later, and kept up the drinking and eating as best as I could, but the cumulative damage was done. I was just gonna fight the rest of the time. Knowing the dangers of heat exhaustion (and worse) I kept checking to make sure that I continued to sweat and convinced myself that I was. 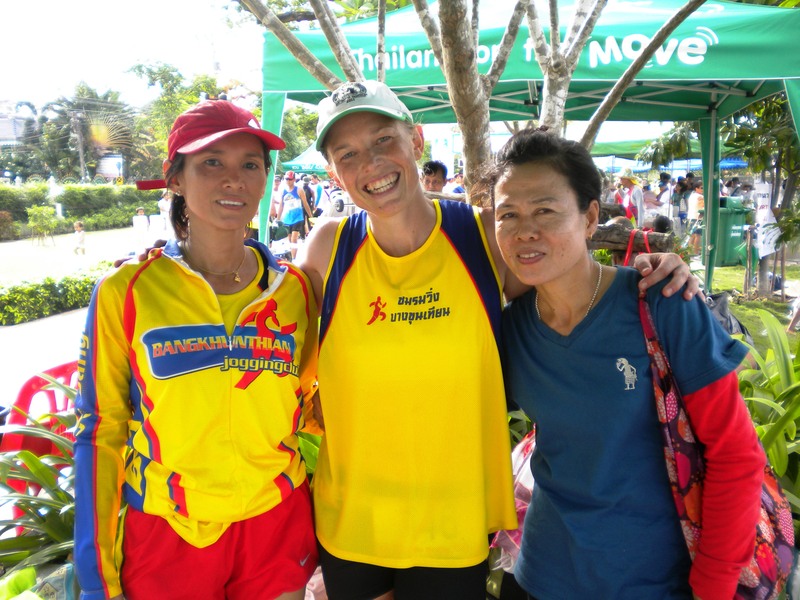 The Thai running community here is helpful and caring to each other as anywhere. I was a perfect stranger – as a lone white female, stranger than most. When I was paralyzed with leg cramps, runners stopped to help massage and sprayed something on them to help. When I was puking, a runner stopped and put his hand on my back just to show he cared. Finally, a one of my new teammates offered (no, insisted) to run with me and I had a buddy for the last two laps – how grateful I was for her! The woman on my right ran with me the last two laps, the one on my left was my masseuse. While I did all that I thought I could do to prepare, it occurred to me that perhaps I should have done more runs at 1pm than at 6am. Sometimes, though, things go wrong and you learn a lot from the experience as well. Even so, I led most of the race and was passed within the last two hours when I really tanked. 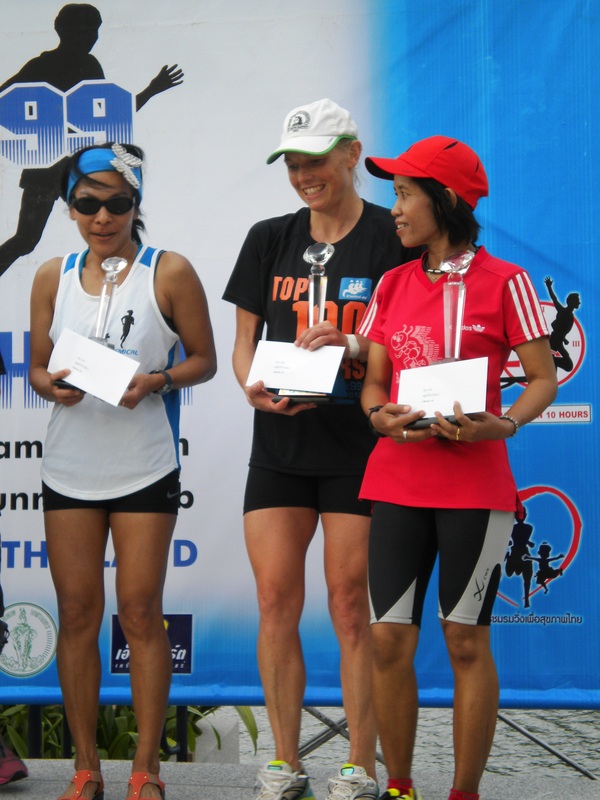 My goal was to reach the women’s record (84km) set by last year’s winner (who didn’t place this year) and if I happened to win or place – great! Second place, a goal achieved, and lessons learned is a great experience indeed! Categories: adventure and sport, expat life, Thailand | Tags: Bangkok, running, Suanpruek 10 Hour Ultramarathon, timed event, ultramarathon | Permalink.